See the flyer. See the sponsorship form. See the Registration Form. Honoring Com Joe Petersberger and Lady Karen. Canyon Ridge band Friday night, Cliff Cody Saturday afternoon, and Reese Dailey Saturday night. Cruise with the 2018 AYC Class!! See the flyer. See the registration form. 2019 Commodore / Fleet Captain Meeting. Vacation with the 2019 AYC Class!! See the flyer and the registration form. NOTE: The date on the FLYER is correct. The date on the FORM is INCORRECT. See "Club Events" for clarification. See the flyer. See the sponsorship form. Cruise with the 2017 AYC Class!! 2017 Commodore / Fleet Captain Meeting. Cancun is the destination for an unforgettable vacation!! 2016 Commodore / Fleet Captain Meeting. Celebrity Cruise Silhouette is the event!! Register by Feb 27, 2015 for special pricing!!!! See the sponsorship form. See the flyer. 2015 Commodore / Fleet Captain Meeting. NOTE: Tickets MUST be purchase prior to January 21, 2015 for proper planning of this event. 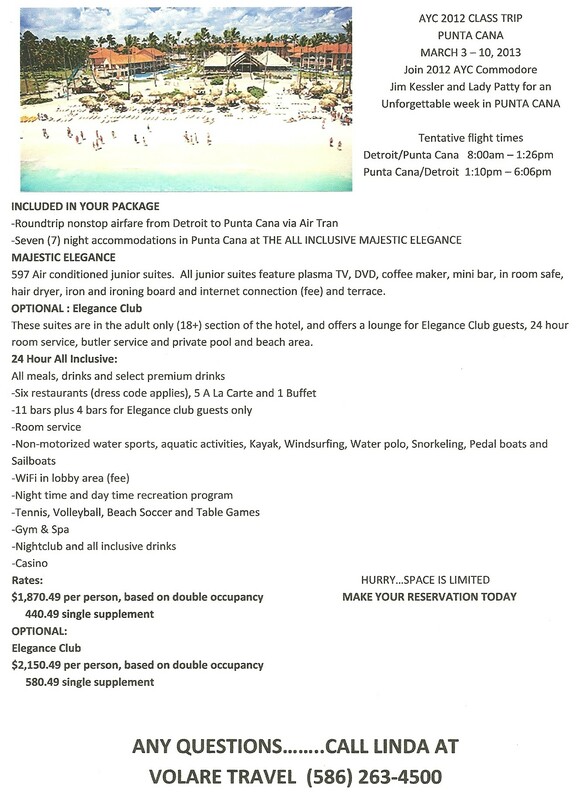 Punta Cana is the destination!! See the sponsorship form in Word. See the sponsorship form in pdf. See the TEAM sign-up form. See the sponsorship form in Word. See the sponsorship form in pdf. See the event flyer. NOTE: The $15 participation fee in the AYC Bike Run INCLUDES this dinner. Meeting at Point Place Boat Club at 1PM. NOTE: Tickets MUST be purchase prior to January 18, 2014 for proper planning of this event. Negril, Jamaica is the destination!! See the MULTI-PAGE flier. See the ONE PAGE flier. Act ASAP for the best possible deal! Use this FORM for either Bowling, Golf, or BOTH to support 2013 AYC V/C Dan Thomas and Lady Nancy. Riviera Maya is the destination!! See the flyer. See the Apple Credit Card Form. AYC Golf outing. Fundraiser for AYC Vice Commodore Jim Kessler and Lady Patty. See the flyer. See the fundraiser form. See the info from Detwiler Golf Course. NOTE: If you have already participated in the joint fundraising with AYC Bowling, you do NOT have to resubmit. All others please support as you can.